Re-energized with a new website, resource center and special discount rate, FPL bolsters community efforts to facilitate expansion projects around the Sunshine State. FPL is investing more than $3 billion to modernize the 1960s-era oil-and-gas-fired Cape Canaveral, Riviera Beach and Port Everglades power plants into high-efficiency natural gas energy centers that will be 33 percent more efficient and 90 percent cleaner. Combined, the plants are projected to save customers more than $1 billion in fuel and other costs during their operating lifetimes while also dramatically reducing emissions and helping to ensure system reliability. The Riviera Beach Clean Energy Center, shown here under construction, is scheduled to open in 2014. Photos courtesy of Florida Power & Light Co. When Cheney Brothers Inc. needed room to expand, Florida Power & Light Company delivered not just the electricity but also the deal-sealing resources that made sure the company kept its food distribution business growing in its home base of Florida. Thanks to FPL's help, Cheney is adding 300 jobs at a $100-million, 250,000-sq.-ft. distribution center in Punta Gorda, just off Interstate 75 near Fort Myers. The expansion continues the Riviera Beach-based company's 88-year tradition of doing business in the Sunshine State. Bill Foley, president of Cheney Brothers, said that FPL's special discounted economic development rate helped make the expansion decision an easy one. "FPL has played an integral role in our project," says Foley. "The special economic development rate allowed us to get in and set up our systems." FPL, headquartered in Juno Beach, offers an economic development rate for commercial and industrial businesses. The discount is available to new or expanding customers that add at least 350 kilowatts of new load and add 10 new jobs per 350 kilowatts of added load. In the first year, eligible business customers receive a 20 percent discount on their electric rate. In year two, the discount is 15 percent. In year three, it is 10 percent; and in year four, it is 5 percent. If the eligible business customer is expanding in commercial or industrial space that has been vacant for more than six months, the discount increases to 25 percent in the first year and 20 percent in the second year. Following that, the discount drops by 5 percent a year and goes through year five. FPL's new economic development rates can potentially save a 350-kW business customer an additional $9,500 to $12,000 in the first year — a savings that helps offset startup, expansion or moving costs for many Florida businesses. "We already have the cheapest rates of any of the 55 electric utility companies in the state," says Lynn Pitts, director of economic development for FPL. "Our rates are very competitive with Georgia Power, Alabama Power and Santee Cooper in South Carolina. This new economic development discount rate will only make us even more competitive." Since launching the new rate program last year, FPL has signed agreements with six expanding companies that are creating a total of 287 new jobs. In addition, FPL has 12 pending agreements that could lead to another 1,500 full-time jobs being created by growing firms in the state. The special rate is but one of several new programs that FPL is rolling out around Florida to make it easier for businesses to grow. A new website and resource center — accessible at PoweringFlorida.com — are also aimed at helping site selectors find just the right location for their company in Florida. The largest electric utility in Florida and one of the largest rate-regulated utilities in the U.S., FPL serves about 4.6 million customer accounts and employs approximately 10,000 workers across 27,000 square miles in Florida. FPL's typical residential customer bills are about 25 percent below the national average. FPL's footprint is extensive, serving 35 Florida counties, stretching from Nassau County (north of Jacksonville) in the northeast to the southern tip of Miami-Dade County and from the Atlantic Coast west to Bradenton-Sarasota. FPL also operates 40 power generation units around the state, generating a total of 23,722 megawatts of net capability. It purchases another 2,078 MW, giving FPL a system-wide total of 25,800 MW in Florida. FPL's power generation portfolio is also very clean … combining nuclear, natural gas, solar and other fuels. Pitts says that FPL wants to be known for its economic development track record as much as its green portfolio performance. "We need to diversify our economy and recruit new businesses to offset the effects of the next recession," says Pitts. "We need to compete with North Carolina and Texas and how aggressive and responsive they are to get deals done on projects." Eric Silagy presents PoweringFlorida.com to Governor Rick Scott with FPL Director of Economic Development Lynn Pitts and VP of External Affairs and Development Pam Rauch looking on. That's why FPL launched PoweringFlorida.com earlier this year, notes Pitts. "Our new website and resource center feature a sites and buildings database, and a comprehensive community profile database, that are unmatched anyplace else," he says. 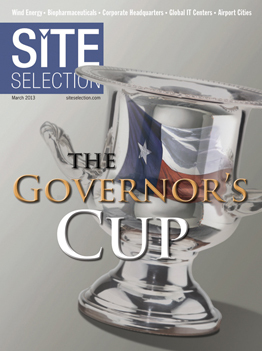 "The site selection consultants that we interviewed extensively before launching this product told us that those two things were the two most critical resources needed on an economic development website." The collection of research tools on PoweringFlorida.com — which are available for free to all participating Florida communities — is exhaustive. The site features a Corporate Inventory section that includes an extensive database of companies, complete with contact information, for each county in Florida. A Location Factor Matching Tool enables economic developers to rate their communities on how closely they measure up to site selector-determined industry location standards. Eric Silagy, left, is president of FPL. Gray Swoope is secretary of commerce of Florida and president and CEO of Enterprise Florida Inc., the state’s official economic development agency. Other components include a Regional Evaluation section, Regional Profile Comparison, Expansion Alerts, and access to data from GIS Planning and EMSI. FPL also plans to launch a certified sites program, adds Pitts. "Our community readiness program will include an element for site certification," he notes. "The main thing we want everyone to know is that we are here to support the efforts of the state and the local economic development organizations to bring more business to Florida and to help existing Florida employers grow." Eric Silagy, president of FPL, says that "Florida has a lot to offer. We have no state income tax. We are a right-to-work state. We have a well-educated work force. We have great companies in technology, aviation and biosciences. We have a modern transportation infrastructure of ports and rail and highways. And we have the lowest electric rates in the state — rates that are more than 25 percent below the national average." Silagy stresses that FPL is not replacing the economic development efforts of Enterprise Florida or the local communities. "Our job is to try to make those folks as successful as possible," he says. "Our goal is to provide them with the necessary tools and information to help site selectors understand the tremendous attributes that Florida has to offer. Two years ago, I challenged my team and said, ‘What can we do to help move Florida forward?' You can't just rely on government and then complain when it doesn't work. The private sector has to step up, and that is exactly what we are doing." Florida, however, must change its approach to economic development, Silagy says. "For many decades, Florida relied on organic growth. We relied on moving vans moving people south to Florida to ensure that we grew our population and our economy at 3 to 4 percent a year," he says. "But now we live in a global, competitive environment. We compete for workers with Canada, Venezuela, Europe and other places around the world." Silagy believes that FPL's investment into new, robust tools for economic development — like the PoweringFlorida.com website and resource center — "will help us compete on the global stage." There is ample evidence that FPL's investment is already paying off. Around the state, corporate facility expansion projects are being announced in FPL's service territory at a steady clip. Cheney Brothers, an 88-year-old food distribution business in Florida, is building a new 250,000-sq.-ft. distribution center in Punta Gorda. FPL’s special economic development discount rate is providing an energy cost savings that is helping Cheney Brothers expand. In Manatee County on the south side of Tampa Bay, Air Products announced plans to expand its LNG heat exchanger manufacturing capacity by constructing a second factory at a new location next to Port Manatee. Air Products completed the purchase of 32 acres for the project in November and plans to open a new 300,000-sq.-ft. plant by 2014, employing 250 workers within four years. "This site has exactly what we need and we are excited to get started," said Sandy McLauchlin, general manager of Air Products' LNG engineering and manufacturing. "We appreciate greatly the efforts of the Bradenton Area Economic Development Corp. and local and state government officials in finding this location and for their support." The Bradenton Area EDC worked closely with FPL officials in identifying the site and facilitating the expansion agreement. "Air Products was a competitive project that we worked very hard to win and we won the deal," says Sharon Hillstrom, president and CEO of the Bradenton Area EDC. In Port St. Lucie on Florida's East Coast, Martin Health System celebrated the "topping out" of the 90-bed Tradition Medical Center in October. Once fully operational by next January, the 201,184-sq.-ft. hospital will create more than 400 jobs. About 1,000 construction workers will be employed during the $110-million building project. "The economic development discount rate was definitely a plus," says Mark Robitaille, president and CEO of Martin Health System. "We needed to reduce our capital costs and our operating costs. This special rate from FPL provided a reduction for five years on our energy bill. It was a significant benefit to us. This is a community, non-profit health system here in Martin County. We employ 3,400 associates, and FPL's assistance helps us hire and retain many workers." Mark Robitaille, president and CEO of Martin Health System, says the FPL economic development rate is making it easier for MHS to build and operate a new 90-bed hospital in Port St. Lucie. Mann Research, meanwhile, is developing a 45,000-sq.-ft. office building next to Tradition Medical Center. "We are leasing 25,000 square feet from them for our administrative offices and clinical research staff and our physician offices," says Robitaille. In a joint venture with Health South, Martin Health System is also building a new rehabilitation hospital in Martin County at the firm's South Hospital. The 34-bed facility will be 46,000 sq. ft. upon completion and employ 100 workers when it opens in May. Robitaille says he senses a new spirit of teamwork on the economic development front in Florida. "One of the key things is that there is a community-minded spirit when it comes to attracting quality businesses to the area," he says. "Look at the history of Torrey Pines. They looked at many locations across the country. Everyone here came together to offer whatever assistance they could to make them feel welcome and help them be successful. They expedited the permit approval process for them. We are small enough to be able to collaborate, but large enough to provide a high quality of life." At Nova Southeastern University in Hollywood, Fla., the school took advantage of the special FPL discount rate to build and open a new $50-million Center of Excellence for Coral Reef Ecosystems Research, the largest facility of its kind in the country. The center created 22 new academic jobs and 300 construction jobs. It also employs 50 graduate students and retains 22 existing academic jobs. "We are grateful for this discounted rate because savings in operational expenses translates into an increased ability to keep our tuition competitive for our students and conduct research activities that help benefit society," said NSU President George L. Hanbury II. "Two years ago, I challenged my team and said, 'What can we do to help move Florida forward?'" A startup glass door manufacturer, Aldora Aluminum and Glass Products, was actually the very first customer to take advantage of FPL's special economic development rate. The company invested more than $1 million to open its business in a 65,000-sq.-ft. facility in Broward County. "This is a tough business climate, and the timing of this new rate was perfect for us," said Leon Silverstein, co-owner of Aldora. The firm began with 28 employees and plans to add 40 more workers within a year. FPL isn't just looking to help Florida businesses expand; it's also got its sights set on Europe. With the help of Michael Krüger of PlanB Consulting GmbH in Berlin, Germany, FPL is aggressively getting into the business of attracting foreign direct investment. "I will be assisting FPL with lead generation in Europe," says Krüger. "The new online resource center will provide intelligence on growing companies across Europe who might be interested in evaluating Florida as part of their globalization strategy. The first thing we do is identify those companies that are looking to expand in the U.S."
Krüger, who has been involved in site selection in Germany since 2002, specializes in helping European-based firms find the optimum locations for their businesses in the U.S.
Krüger says his goal is to make contact with 1,000 European companies that fit the industry targets of FPL and Enterprise Florida over the next 12 months. "We will focus on companies in the aviation and life-science sectors," he adds. "We will then see how their requirements fit with what Florida has to offer." Krüger says he plans to travel to meet with companies in Italy, Spain, Switzerland, Scandinavia, Germany, the U.K. and the Benelux region. "Those are the core countries that are interested in Florida," he says. "Our prime interest is to support the strategic goals of FPL and Enterprise Florida," he adds. "Florida is a very attractive destination right now for many European companies. It offers an extremely attractive climate, and it is very competitive on costs. We expect this program to be a huge success for FPL and for everyone who's focused on bringing more industry and jobs to Florida."